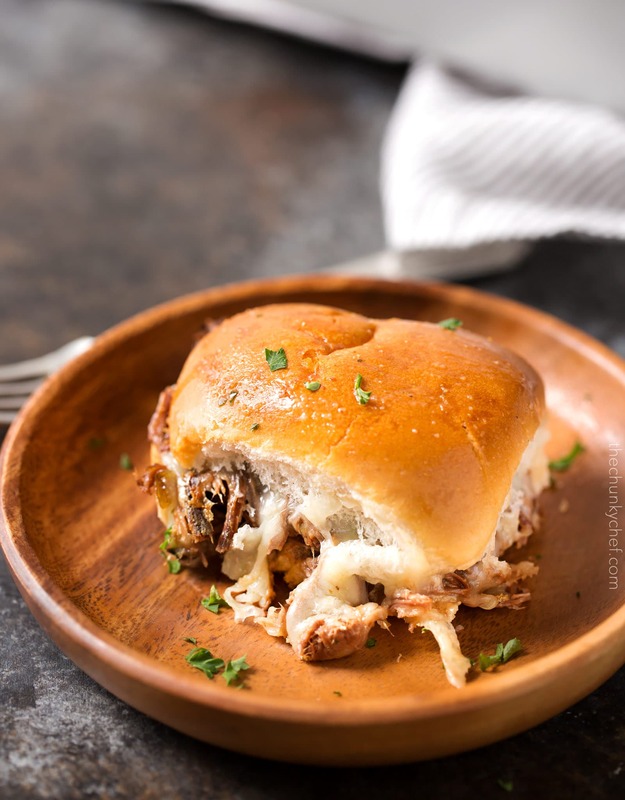 These easy baked beef sliders are piled high with slow cooker shredded Italian beef, plenty of gooey cheese and brushed with melted garlic butter! 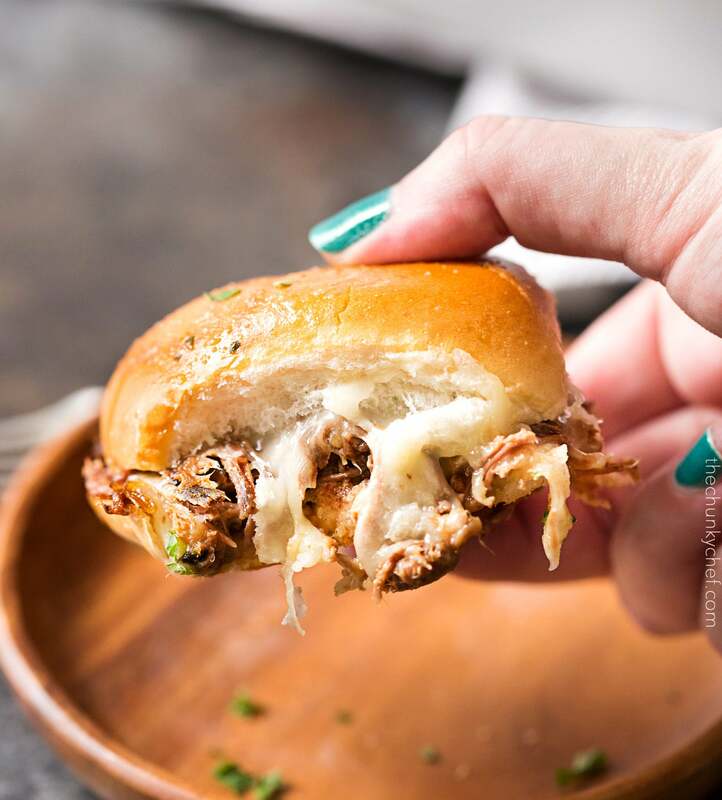 Perfect for a party or a casual weekday dinner, these Italian beef sliders are incredibly easy and guaranteed to make your mouth water!! 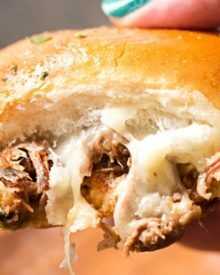 Remember last week when I shared that mouthwatering slow cooker shredded Italian beef? I mentioned that I had another recipe coming up that used that beef… and here it is!! I’ve always been a sucker for sliders. Anything in a fun, cute little three bite sandwich is instantly about 10x better, right? This time, I went with a tried and true combination of the succulent Italian beef, provolone cheese and garlic butter… and it does NOT disappoint!! Usually when I think of sliders, I think of party food, but I actually like to serve sliders for dinner. It’s a fun way to change things up, and it get the kids more excited about dinner time! When I made these during the day so I could take these photos, it was all I could do to not put my camera down and just sit and gorge myself on sliders. But I was good and I settled for a modest lunch (of beef sliders of course) AFTER the photoshoot was over lol. I didn’t add any other toppings to these… just the beef and cheese, but if you’re a huge fan of pepperoncini or banana peppers, feel free to add some extra peppers on top of the beef (before the cheese layer) and jazz it up to your liking. Okay so let’s talk about slider rolls. You can make this recipe with just about any kind of rolls… although the only two I’ve used are Hawaiian rolls and potato rolls. Both are equally delicious! This beef slider is for you!! 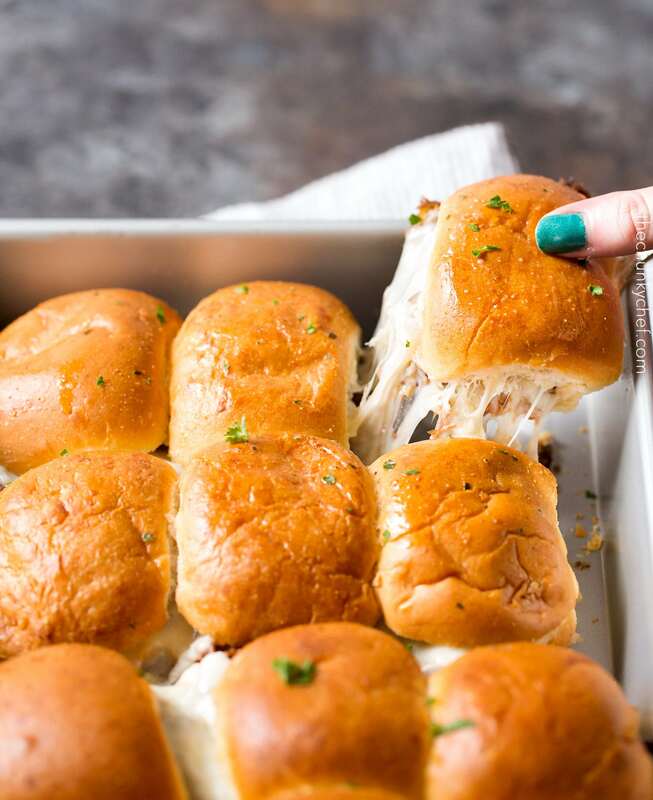 I hope you all try these Baked Italian Beef Sliders for your next party or easy weeknight dinner! Preheat oven to 350 degrees F. Lightly spray a 13x9" baking pan with non stick cooking spray. Without separating the individual rolls, carefully slice across the rolls horizontally to create a top layer and bottom layer. Repeat with other pack of rolls. Place bottom layers of both packages of rolls into the prepared baking pan. Depending on the brand of rolls, it might be a tight fit, or you may have to use 2 pans. Spread a very thin layer of mayonnaise over the bottom layer of rolls, then top with a generous portion of shredded Italian beef. 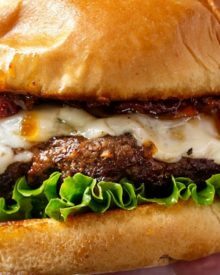 Lay slices of provolone cheese on top of the beef and top with the top layer of rolls. Combine melted butter and garlic powder and brush over top of rolls. You may have some butter leftover, depending on how liberal you were with brushing it on. Bake for 7-10 minutes, until rolls are golden brown and cheese is melted. Sprinkle with minced parsley (optional) and serve. I will be making these for “Deer Camp” party! These are SO delicious…I’ve made them four times now….I did the beef in the instant pot and it was OMGood! My kids ask for these about once a month, so they are on the rotation! Thank you! I’m eternally grateful you shared this. I am by no means a chef; since moving in with my fiance, I’m trying to find simple things to make with limited time and my limited skills. I used Jack Daniels pulled beef and followed everything to a tee but with extra garlic. It was SO DELICIOUS! They’re so easy to make, inexpensive, and easy to eat and clean after. Thanks again! I’m drooling right now. I recently moved to the PNW and they don’t have Italian Beef! What kind of nonsense is THAT?!? Anyway, these cute Italian Beef sliders look like the perfect way to satisfy my IB craving! YUM!!! My family loves sliders, so these are definitely going on the menu! These would be amazing for a game day party. I am totally craving these, yum! Now this is the kind of meal I dream about! I am loving that cheese and the garlic butter! Such a winner! This is the perfect party food! Great idea to use these ingredients – very tasty, for sure! These sliders just make me SO happy! What a delicious combination of flavors! And what a brilliant dish to make for a party or a random weeknight get-together! 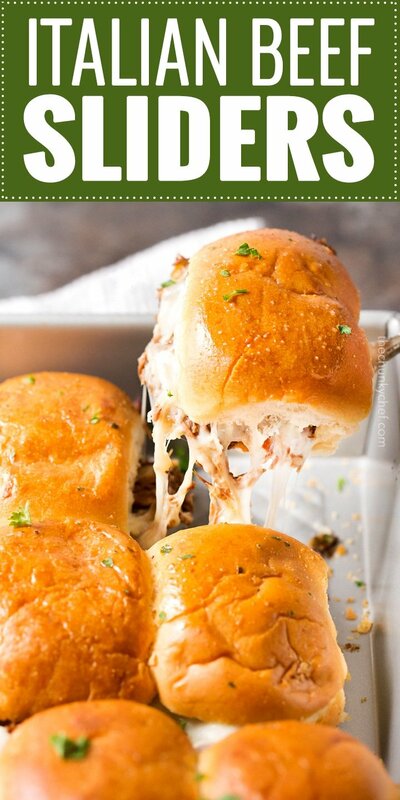 These sliders have me drooling already and I haven’t even had my morning coffee yet! Yum!! These are perfect for a spring time gathering!